It’s the familiar “I met someone” starry-eyed glow. “He’s so good to me. He gets along so well with my family, and he respects me. I’m really happy, and it’s getting pretty serious.” It’s a conversation I’ve had a few times. Different young women, same scenario. Being the listener and question-asker that I am, my probing eventually lands on the catch: “He’s not a Believer but…” There’s always a ‘but’, isn’t there? He said he’ll go to church with me, he was burned by a church once, or he’s really open to spiritual things, so it’s only a matter of time, right? Our hearts so long for connection and intimacy with others that justification has to be employed at the expense of our better judgement. I’m not here to dive into the meaning of “unequally yoked” or the greater risk of future heathen children. Us millennials like to roll our eyes at familiar speeches, anyways. I want to approach this topic from a different angle- one that I believe to be equally as Biblical. You see, these kinds of discussions can easily turn into an “us vs. them” refrain that neglects the spiritual well-being of everyone involved. In other words, instead of painting the unbelieving partner as the evil scoffer that bids enlightened but weak spirits to sit and join in their wickedness, have we ever stopped to consider that they, like us, are souls in need of God’s grace? Is it likely that an unbelieving boyfriend or girlfriend will spiritually benefit from an unequally yoked relationship? I don’t think so, and here are three reasons why. Someone who has been bought by the blood of Jesus should have different goals than someone who hasn’t. As believers, our lives should be marked by our ultimate purpose of building God’s kingdom. This affects the way we treat our finances, the way we pursue purity, and the way we spend our time. Unbelievers don’t have the same definitive objective, and so their choices are affected by their earth-bound ties. On this topic, the negative pull on the believing boyfriend or girlfriend down slippery slopes is typically what gets highlighted in the argument against dating outside the faith. But have you ever thought about the unfairness of shackling an unbeliever to heavenly goals, when they may not be able to one day reap the heavenly rewards? In other words, if you are holding steadfast to boundaries that protect your purity and pastimes that honor the Lord, the unbeliever is being forced under the law when grace to follow God has not yet been granted to them. We have accepted God’s free gifts of love and mercy to end that kind of slavery, so why would we wish that kind of life on someone we care for? Simply put, it is unkind, and realistically, it will create hurtful tension. This next one might hurt a bit, but please, oh please, take it with a heaping spoonful of sisterly love. If your ultimate goal is to win your sweetheart over while dating them, you are unintentionally sending a subtle message. This memo communicates that you aren’t very serious about your relationship with God, at least not when it comes to relationships, because you are compromising on His will for you. And if your commitment to Jesus is lacking, you don’t give much incentive for anyone close to you to follow Him, too. At best, you set an example of Christianity that picks and chooses from godly prescriptions. We want the people we care about to find in us a model of godly courage that leads them to the same kind of zeal for living that Jesus has. Sometimes that means skipping out on momentary happiness and potentially hurting feelings, understanding that God’s recommendations do not lead to disaster in the long run. Relationships tend to throw a smoky rave in your frontal cortex in a manner that clouds better judgment. Additionally, spiritual warfare is real, and if someone is truly a spiritual-seeker, a new relationship could be just the thing that the enemy uses to preoccupy their spirit. In C.S. Lewis’ Screwtape Letters, an elder demon makes the following statement in coaching a newbie. Although it is a fictional story, Lewis provides insight into the spiritual realm. The movement of a human soul towards the eternal freedom found in Christ is a fragile process. It is difficult enough for Believers to keep their commitment to Christ central in a dating relationship, so imagine how much more arduous it can become for an unbeliever to prioritize spiritual progress in the same circumstances. If you truly hope for someone’s journey with Jesus to begin, the most loving thing you can do is allow and pray for them to have space to encounter God, free from the distraction of a dating relationship. Perhaps in reading this, you find yourself lost in the exceptions. 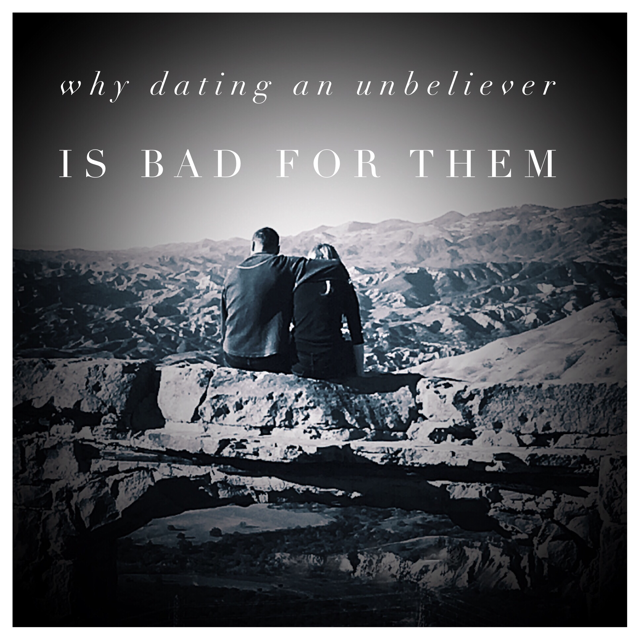 It’s nice to talk about better/best scenarios in theory, but what about the real-life dating relationships that do result in the unbeliever giving their life to Christ? To that I would say: give credit where credit is due. We serve a gracious and powerful God who is all about redeeming our mistakes for His glory. The genuine conversion that occurs in “missionary dating” is more likely in spite of the relationship, not because of it. Truly loving someone means caring about their soul more than anything else. Jesus didn’t promise us an easy life. But His yoke becomes easy and His burden becomes light when we look to Him for wisdom and guidance, when we lean on Him for strength to sort through the difficult choices in life, and when we see people how He sees them- with loving, eternal lenses. So how should we tread the waters that lead us through the tension of having romantic feelings for someone who isn’t committed to Christ? Show them the right kind of compassion. Introduce them to your community. Intentionally seek out people who are more fitted to pour into them without the risk of an emotional attachment. And absolutely pray. When we align ourselves to God in prayer, our desires can begin match His. We will start to recognize our inability to support the future unbelievers want, our need to provide a courageous example of faith, and our commitment to see others first and foremost as souls in need of a Savior. My doors were opened, and dinner was paid for. Anecdote-prompted laughter, a dive into the Colorado River, and an accepted challenge to run the last bit of a hike back to the car are the other details that stand out. That night, I walked through my door on cloud nine, grateful for the full day and God’s gifts. The funny part is, it really sounds like I’m describing a date. Not exactly. The door-opener happens to be my best friend’s boyfriend, and before you think I’m a horrible person, I need to mention that she was there as well. Me and my bestie have always wondered what it would look like for one of us to start dating someone. In a long season of singleness and God’s gentle and loving “No’s” for a status change, our friendship has been the one area of our lives where God hasn’t withheld ANYTHING. If I had the time, I could tell you about countless adventures where God clearly showed up, just showering us with good gifts. It’s this beautiful mixture of deep, Jesus-loving conversations as we sit on kitchen counters and spontaneous bouts of silliness that leave us with stomach aches from laughing so hard and people around us wondering if any illegal substances are involved. Nope, all natural. My parents adopted her into our family as their third daughter, and we get to work and live together. Free time, adventure, weekends, and humorous meme texts have been spent on each other for almost a decade, and so it seemed like a step towards marriage for either one of us might throw off the sisterhood we’ve been blessed to build. About 6 months ago, she met someone, and I find myself in the midst of figuring out what it looks like to share her. As it turns out, It’s not as difficult as I thought it would be. They actually invite me to hang out with them on dates and she’s really gracious to check up on me every once in a while, to ask if anything about their interaction makes me uncomfortable. More than just surviving this new era, I find myself actually enjoying it. And it’s got me asking a question: What is the difference between the friendships that disappear with a new relationship and those that are actually enhanced? I think of a friend from college whose spouse was quick to give me the title of friend. Since I mattered to her, I was going to matter to him, too. Alternatively, I think of other scenarios where hanging out with an old friend and their boyfriend or spouse was just plain uncomfortable. I’m sure we can all think of a time when an excess of “coupling” left you looking for an exit or conversation suffered a slow death because the counterpart you don’t know as well wasn’t as keen on getting to know you. Or maybe after a new relationship, a friend decides that they don’t have much in common with you anymore, and it’s time for them to start hanging out with other couples at the expense of your friendship. Here’s my next question: As Believer’s, should we allow the natural drift that tends to happen when people pair off? My opinion is no, but since I’m biased, I will explain, in detail, why you should pay attention to the third wheels in your life. 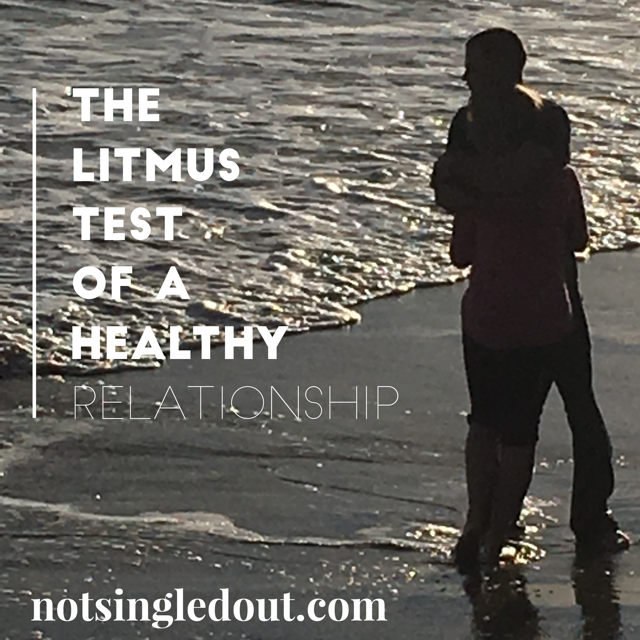 I intend to convince you that they are one of the best indicators of a healthy relationship. I’m sure we’ve all heard this sentiment, but as a single person, this truth is something that I’ve had to hang onto for dear life at times. If God’s goal in rescuing us into His family is to build His kingdom, then the reason for my season of singleness must be that He knows I can serve Him better this way. Should He choose to throw an eligible bachelor into the equation, it can only mean that our union enhances how we serve others, helping them know and love Jesus more. Alternatively, if a couple behaves in a way that cuts them off from some of the people in their lives, they are potentially less fruitful than when they were single. A Kingdom-call-answering relationship should enhance the gifts of those involved in a way that blesses those around them. We typically think about the necessity of community in a new relationship because of the pitfalls that dating life bring about. But every season of life offers its own challenges that require community, and not the kind of community that segregates the church into teens, singles, young marrieds, married with kids, etc. I love the passage in 1 Corinthians 12 that compares the church to a body. Verse 18 says that “God arranged the members in the body, each one of them, as He chose.” Verse 21 goes on to say “The eye cannot say to the hand, ‘I have no need of you,’ nor again the head to the feet, ‘I have no need of you.’” The natural separation that happens sometimes between single and married people can often sound like that. But this passage flies in the face of what is natural. Verse 13 says that “in one Spirit we were all baptized into one body, Jews or Greeks, slaves or free.” We need each other. We have all been given unique gifts and insight due to our unique callings by the same Spirit, and much like a limb being cut off from blood-flow, when we cut ourselves off from each other, we miss out and fall asleep. 3. The Gospel needs to be on display. From Ephesians 5 and elsewhere, we understand that the main purpose of marriage, as God designed from the beginning, is to put the Gospel on display. In this image, the husband loves sacrificially like Christ loves the church and the bride responds in respect and service. They prefer and serve each other in a beautiful dance that puts Fred Astaire and Ginger Rogers to shame. We are all given lights that serve as a testimony of God’s love and work in our lives, but the combining of two lights in marriage should provide a much brighter light to their spheres of influence. An isolated couple might as well cover the light they’ve been entrusted with because no one can see it anyways. I’m reminded of a song from my childhood. “Hide it under a bushel, no! I’m gonna let it shine.” (And now it’s in your head, isn’t it?) If you are a Christian and you are in a relationship, you have been entrusted with beautiful truths that are meant to shine bright for ALL to see, not just those who have lots in common with you. You may recall from high school chemistry that a litmus test is performed to tell you how acidic or basic a solution is. In a similar way, a couple’s interaction with the plus nones in their lives will indicate the health of their relationship. The kind of dating or marriage relationship that encourages the single people in its sphere speaks to an understanding of its purpose, God-given community, and gospel-reflecting interaction. For married and dating couples reading this, let me ask one more question. Have you checked in on your single friends lately? They might have some valuable insight to share on how inclusive and caring your relationship is towards outsiders. Ask them if they can see the Gospel up-close in the image you reflect. Don’t have any single friends, anymore? Well maybe you have some work to do. Much like the pins and needles sensation of a limb regaining feeling, it might not be easy. But it will be worth it. I so treasure the friendships of couples who allow me to live life with them and treat me like family. I’m sure we can all think of cringe-worthy moments in our past that we would like to somehow forever forget or reach back in time to physically erase. Memories that don’t just relay the particulars of an event, but the kind that summon the flood of feelings you felt in a moment that revealed your lack of social skills. Perhaps it’s that time you had an uncomfortably-forced conversation with a crush to fill silence that resulted in you asking questions and then interrupting or making a mess of the English language with an onslaught of uncharacteristic grammar mistakes. Or maybe it was the time when you went to pray for an assigned prayer request in a large group and COMPLETELY forgot the name of the person you were supposed to be praying for- a woman who not only had a name very similar to yours, but one whom you had known for a couple years. Ugh…and now, just like that, all the feelings are flooding back. These memories feel “icky”, and so us millennials fear and avoid awkwardness like the plague. But have we ever stopped to consider the benefits of these less-than-ideal experiences? In this article, I will make a case for embracing that which is awkward. How often do we dislike something in the moment but grow to find the humor in it later on? Like that one time I volunteered at the Special Olympics and a young Olympian (probably around the age where puberty incapacitates better judgment) pulled up my shirt instead of going for my high-five. Extremely blush-worthy at the time, but it is now probably a top 3 funniest memory with my bestie, who witnessed the whole event. The wonderful medicine of laughter is often brought to us by awkward moments. It’s good to be reminded every once in a while that we don’t have it all together. When speech comes out in moron or a conversation dies with no hope of resurrection in the wake of awkward silence, the façade of autonomous control is shattered. It reminds us that we are so much more limited than we give ourselves credit for. In fact, I’m convinced that no one lets me down more than I do. And once we recognize our inability to truly control, we are primed to see God’s ultimate authority over the happenings in our daily lives. There’s a kind of camaraderie that is struck when we are vulnerable about our humanity. Perfectly confident people are intimidating. Us millennials value authenticity, and awkward moments have a way of forcing us to be truly authentic. When our actions admit our deficiencies, people tend to let their guard down because you’ve already broken the awkward ice, thus building community. Any kind of inner struggle offers a way to draw near to Christ. We all love to see the arrogant antagonist in a movie humbled by embarrassment. A chocolate shake spilled over their head, an embarrassing secret coming to light, or a climax where they don’t get the girl or the guy all make for entertaining, even satisfying endings to a film. But have you ever thought about how sometimes, maybe God allows awkward or embarrassing moments in our lives to point out our own pride? We don’t like to admit to admit arrogance, but sometimes falls are justified by our preceding pride. The difference, of course, is that God isn’t a laughing spectator, but is instead a loving Father who knows what we need to become who He has designed us to be. Sometimes, awkward moments are exactly what we need to refine our character. So. The next time you start to kick yourself or dig an escape route, fight to see the bigger picture. Ask for Jesus’ help in the all-too familiar battle of truth over feelings, remembering that he lived our worst nightmare as a crowd mocked Him. All for love. All for redemption, so that all things could be redeemed. Yes, even our awkward moments. Stop Building Your Own Kingdom! I recently passed the 10th anniversary of graduating high school. In other words, I have officially been “adulting” for over a decade. It has been over ten years since I turned 18. More than ten years since I was able to make adult decisions like whether or not to vote, smoke, or ride a bicycle without a helmet. Ten years since I finished my senior year of high school and jumped into the fuzzy unknown of the “real world.” Ten years of figuring out life apart from the innocence of childhood or the confusion of teenage crisis. A lot can happen in a decade. I think back to the dreams and goals I had when I grabbed a diploma and moved a tassel. My 18 year-old self would probably have been disappointed and confused with how my life has turned out. Despite her excitement over the game-changing product that is dry shampoo, she would have wondered why it took me an extra year to finish college. She would have scratched her head as to why I’m not a medical doctor, finishing out my training in some prestigious residency program. She would have sighed disapprovingly at having ended up in the desert, of all places. She would look at my insecurities and wonder why I don’t seem to “have it together” yet. And she would definitely call out my singleness, wondering how I messed up on my golden opportunity at a Christian college campus, where you’re supposed to get your MRS degree along with your Bachelor’s! Alas! She has so much to learn! If she was sitting next to me in all her judgment, I would have so much to offer her in explaining how flawed her plan is and how much more glorious God’s plan is! At 18, I was basically off to achieve a Christian version of the American Dream. I wanted to have a successful career that not only paid well, but helped people so that I could have money AND meaning in my life. I wanted to be married right after college so that I could be a young mom and live in a suburban area where I could own a ranch with barnyard animals- all wrapped up in a white picket fence with the merits of life, liberty and the pursuit of happiness. Little did I know, God was paving a much different path, one that would eventually reveal a fundamental flaw in my plot. My main issue? I was building my own kingdom. Sure, I wanted God to play a part in my screenplay- an important one, even. But I didn’t want Him to draw outside my lines. 1 Thessalonians 2:12 says that God “calls us into HIS own kingdom.” A lot of heartache comes when we reverse that and call God into OUR kingdom, acting like He owes us things He hasn’t promised. So what’s the problem with building our own kingdom over God’s? Isn’t it a good thing to want freedom, financial success, and a family? Well, for one, our kingdom dies with us. If it’s earthly, it goes. Marriage, career, dwelling… all the things and statuses dissolve or transform in eternity. Marriage turns to siblinghood, corporate ladders crumble, and earthly homes are traded for lodging prepared by Jesus that won’t have water heaters that break and leak into the apartment below you. Additionally, earthly kingdom-building makes us near-sighted. We ignore the eternal things that God has promised us because we are so enthralled with what we want to create and experience this side of heaven. In short, it’s idolatry, and in my 20’s, I had to come to terms with that to see the bigger picture. After a fainting spell in a hospital internship (long story), a dateless existence in college, and a couple years spent in cubicle world, I had a couple of options. I could pout and be eaten away by discontentment or I could relinquish the script over to God. Honestly, I chose a mixture of both, but I don’t think He erased the original draft completely. There may be things He chooses to still weave in, in His timing. Want to know the most beautiful part? In allowing God to trail blaze the best route into eternity, I’m constantly amazed at His goodness and supreme ability to screen write. And if my 18-year-old self were sitting next to me, I would try to convince her of that. But I don’t think I would tell her about the details. I wouldn’t tell her how much she would eventually enjoy teaching science to rowdy high school students. I wouldn’t divulge how incomparable California sunsets and thunderstorms are to Nevada ones. I wouldn’t tell her about all the adventure, passion, and growth that singleness has afforded. I wouldn’t tell her about a best friend whom God will use to change her life. I wouldn’t tell her about earlier this week, when I hung out with an amazing group of students and cried ugly tears all the way home because one is leaving for college. I would leave those beautiful things to be discovered because it was a slow but necessary path in giving up my kingdom for God’s. So what about you? Did my story bring anything to light about whose kingdom you’re toiling for? Have you seen the futility in laying earthly bricks? I’m convinced we often don’t dream big enough. In plotting out of our own abilities, we don’t have access to much. But Jesus has all the resources and power we lack. Will you surrender to Him and join His kingdom work?